This is not a review of the book, but rather the reader. He's awful. His voice is tinny and hard to understand and his manner of speaking, or reading, is rhythmic and shrill. I kept trying to get around it, but it was no use. I couldn't get past the first chapter. The narration sounds like its coming from the bottom of a rain barrel --- muffled, fuzzy and the same for ALL the voices,,, how can Pascoe and Dalziel sound alike? I usually love everything by Hill but I couldn't get past the narration to decide it I liked this one! Turned it off within 10 minutes. I would much rather listen to Colin Buchannan. Clever but narrator has a cold? 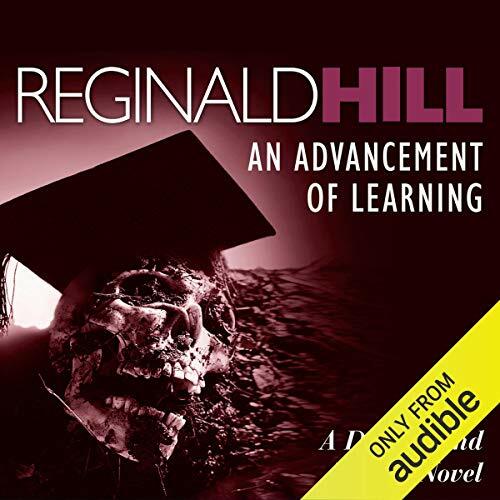 I had read only one Reginald Hill novel (the first in the series) when I downloaded An Advancement of Learning. With this novel, the relationship between the two major characters seems better developed, more humorous, and the novel overall much wittier. That said, I listen to audiobooks while I walk or exercise, and Brian Glover is not an ideal reader for these circumstances, nor is the quality of the recording up to usual Audible standards. I believe another reviewer complained about Glover's accent, but that seemed fairly easy for this American listener to get used to. However, the man also sounds as if he has a cold about half the time and slurs his words a bit. Add in the occasional patch of white noise (a result of low-tech editing? ), and this audiobook can be a bit annoying to listen to. The sound level also seems to vary up and down at odd times so that I found myself frequently adjusting the volume. So, I, based on my experience of only two mysteries, I recommend Hill's work for those attracted to quirky characters and witty wordplay, but I can't recommend Brian Glover as a narrator or this particular recording. This is the first audiobook to which I've listened that has been so substandard in performance and audio quality. There is a reasonably good Dalziel & Pascoe story being read here, but the audio quality is very muddy, and the voices portrayed for characters are not consistent, distinctive or appropriate. Other readers use Yorkshire and other regional British dialects and voice Andy "The Fat Man" Dalziel with a growling bass tone that leaves the listener with no doubt as to which character is speaking. Based on this audiobook I would be hesitant to listen to other titles with this reader, and I'll be more inclined to heed other reviews about bad audio quality. The reading is really disappointing. Reginald Hill is seriously let down by the performance of his book's readers. I wish I had read the earlier reviews of this book. I would have saved some money. The reader is awful. I can only understand him if I am concentrating carefully. Since I usually listen to audio books while driving, that is just not possible. The same reader read for another Reginald Hill book I have and did fine, but not in this case. Reader is terrible and so is the sound quality. The story isn't bad. The series improves from this early effort. If this is the first one you've listened to don't judge by this one. I love listening to books on tape during my commute. This one is the first where the recording quality plus the accent made the experience challenging. I honestly can't speak to the story because I didn't listen to much of it. The recording sounds as though it were dubbed from a overused first generation Walkman played back from under a pillow. Coupled with an overwrought performance, it's altogether unlistenable.